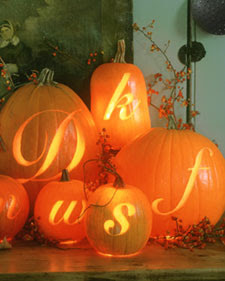 LOVE LOVE LOVE THIS IDEA - Create a monogram or initial on a pumpkin! Use this idea for your doorstep to greet trick or treaters, have it line the aisle at your next outdoor wedding ceremony or even use the smaller size as a centerpiece. Right now Michaels and AC Moore have carvable pumpkins that you can keep year to year. You can't use real candles inside but you could put battery operated white lights. I am making mine today! The next day, after a surprising realization, I asked my doctor to putme on the pill. My wife complains that she will look like a little kidbut I tell her to shutup and lay there and like it. Hey would you mind sharing which blog platform you're using? I'm going to start my own blog soon but I'm having a tough time making a decision between BlogEngine/Wordpress/B2evolution and Drupal. The reason I ask is because your design seems different then most blogs and I'm looking for something unique. hello there and thank you for your information – I've definitely picked up anything new from right here. I did however expertise some technical points using this site, since I experienced to reload the site a lot of times previous to I could get it to load correctly. I had been wondering if your web hosting is OK? Not that I am complaining, but sluggish loading instances times will very frequently affect your placement in google and can damage your high-quality score if advertising and marketing with Adwords. Well I am adding this RSS to my email and could look out for much more of your respective fascinating content. Make sure you update this again very soon. It's always helpful to read through content from other authors and practice a little something from other web sites. clicks here The lower coverage only covers healthcare facility sessions or unexpected emergency attention, but you will save cash. If your pet is an indoor animal only and your annual veterinary bills are for check-ups then you might want to think about opening a bank account for pet emergencies.